Quantitative models have a long tradition in developmental biology. The most common approach specifies the systems as ordinary differential equations (ODE). The equations describe the concentrations of reactants over time. This illustration is licensed under a Creative Commons Attribution-NonCommercial-NoDerivs 3.0 Unported License. Our research particularly focuses on the Wnt signaling pathway, and on models for stem cell renewal and ageing. K. Hein, G. Mittler, W. Cizelsky, M. Kühl, F. Ferrante, R. Liefke, I. M. Berger, S. Just, J. E. Sträng, H. A Kestler, F. Oswald, T. Borggrefe. Site-specific methylation of Notch1 controls the amplitude and duration of the Notch1 response. Science signaling, 8(369):ra30, 2015. J. Wang, Q. Sun, Y. Morita, H. Jiang, A. Groß, A. Lechel, K. Hildner, L. M. Guachalla, A. Gompf, D. Hartmann, A. Schambach, T. Wuestefeld, D. Dauch, H. Schrezenmeier, W. Hofmann, H. Nakauchi, Z. Ju, H. A. Kestler, L. Zender, and K. L. Rudolph. 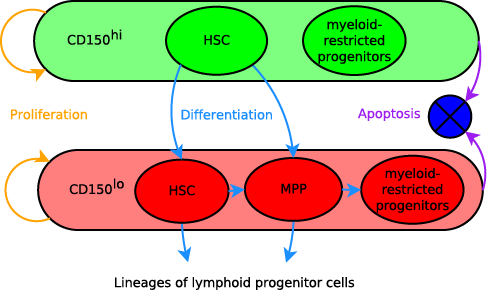 A differentiation checkpoint limits hematopoietic stem cell Self-Renewal in response to DNA damage. Cell, 148(5):1001–1014, 2012. H. A. Kestler and M. Kühl. Generating a Wnt switch: it's all about the right dosage. J Cell Biol, 193(3):431–3, 2011. H. A. Kestler, C. Wawra, B. Kracher, and M. Kühl. Network modelling of signal transduction: establishing the global view. BioEssays, 30(11-12):1110–1125, 2008. C. Wawra, M. Kühl, and H. A. Kestler. Extended analyses of the Wnt/beta-catenin pathway: Robustness and oscillatory behaviour. FEBS Lett, 581/21:4043–4048, 2007.